Congress today held threadbare discussions on over all socio political scenario obtaining in the backdrop of misrule mismanagement by both State and Centre Govt. 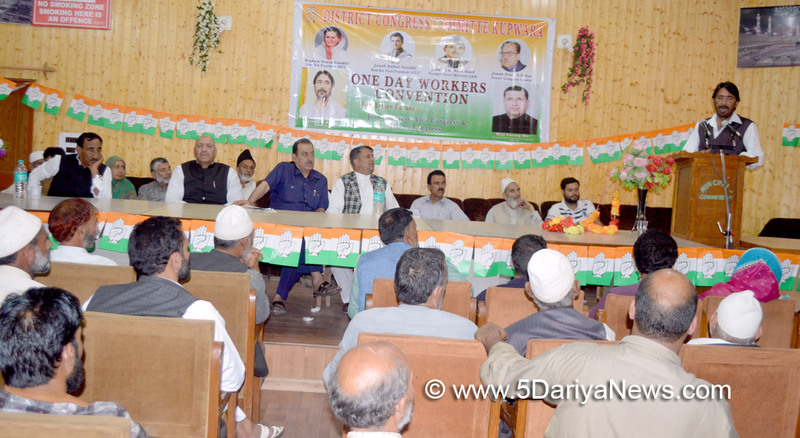 Congress also had discussion over the malicious campaign launched against Special Status of the State especially Article 35-A and described it as a move to change the demography of state and pledged to continue to fight against wrong, anti-people policies of the PDP BJP.Addressing the Party Convention at Bandipora, Baramulla and Kupwara Districts today the J&K Pradesh Congress Committee (JKPCC) President G.A. Mir lashed out at both State and Centre Govts for failing to win the hearts of people citing the reason as malicious campaign being launched against the people, especially the Special Status of the State.Mentioning that RSS BJP is desperate enough to erode the constitutional authority of the state to serve their vested, G.A. Mir warned that any attempt to weaken Special Status will be defeated tooth and nail. PDP is fully responsible for the current fiasco and can escape the responsibility of death and destruction in the valley, Mir said. Stating that PDP has crossed all limits of mis-governance, Mir said Mehbooba is adopting dictatorial attitude of Narinder Modi, who is in habit of suppressing the voices being raised against his wrong policies and was out to crush the genuine voice of the people. Mehbooba is adopting same Policies here in the State in order to seek extensions in her service, as that the performance of her Govt on ground level is zero and disappointing, but despite that she is getting the extensions of her service on every visit to Delhi.He expressed confidence that people have realised as to how they were betrayed by the PDP for electoral gains, as the PDP secured votes to checkmate BJP, but aligned with same party for the sake of power by not caring about the urges of people.He briefed the cadres about the fallout of fiddling with Art 35 A, which is main component of Special Status saying that any attempt to weaken it will be a dangerous proposition fraught with serious consequences.